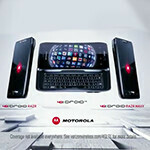 Verizon’s Droid Does campaign is back. The most recent incarnation loses the sharper edges of the original – digital voices and CG robotic arms are out in favor of a kinder, more friendly voiceover that targets families and “average” users over the techie, cutting edge users that the original series aimed for. The changes reflect the maturity of the smartphone market today – when Verizon launched the original ad series in 2009 Verizon was struggling to create a marketable brand around an operating system (Android) that did not have the same name recognition of the Apples and RIM’s of the world. They were also aiming at the early adopter market, since in 2009 smartphones were more of a niche product aimed at those who needed (or wanted) to be always connected to the web, email, and social media. Now more than half of the phones Verizon sells are smartphones, and they want to make them more approachable to the market segment that has been slower to adopt them. Did they do a good job? Watch the clip below and share your take in the comments section. interesting. i think if theyre going to pay george lucas for the use of droid, the should at least use C3PO and R2D2... and Darth Vader. First of all verizon didnt pay George Lucas. They ask permission for the DROID NAME. Second Darth Vader isnt a DROID. Hes part robot/human. And Im sure Verizon gave George Lucas a DROID PHONE. Third theirs A R2-D2 DROID 3 Special Edition but no C3PO. Learn the way of the force before you say something. i know the ways of the force. the term robot wasnt ever used in the star wars movies, it was droid. by saying that darth vader was part robot and human means that you really said that he was part droid. i also think it would be a decent idea to have a C3PO edition droid. Im also pretty positive that motorola paid george lucas some cash to use the term "droid". inspector f*ggot. eh, it's okay but i'll miss the darker approach of the previous ads. i hope they still do the darker marketing campaigns for new Droid handsets and do these for promotional offers and other stuff. I liked the Bionic commercials. I can see some Memes coming out of this if they start using ridiculous Droid Does lines. I don't always drink beer, but Droid Does. I still think the pop art one they did comparing the iPhone to a porcelain princess was the best ad they ever did. Of course, now they can't make fun of the iPhone anymore. This is a good move for Verizon. Focusing almost solely on techie stuff made for great sci fi, but terrible marketing. The company's producing VZW's Droid lineup need to come up with something fresh as the lineup is starting to look a little stale when you compare it to AT&T. I should know as I own phones and pay for services with each company. on the Windows Phone front yes but definitely not on the Android front. Maybe they should focus on providing more quality phones and value to the customers over using flashy and over the top commercials. I'm so sick of saying, "Droid (insert name here)". I wish they would adopt the naming convention that Apple uses (iPhone 1, 2.... the "next" iPhone). If Apple made a commercial about stupid Android phone names, "Samsung Galaxy S II Epic 4G Touch" would be enough said. Maybe it's easier for someone to walk into a store and say, "Yeah, I was thinking of getting that 4G iPhone." rather than "Lord Dralkar has sent us to acquire all your SGS2E4GT smartphones." ...then why don't you just stop saying it? Just say Bionic, or Razr, or Incredible or whatever.